After many years of coming to Belize on short term mission trips, the Lord spoke to Lee and Robyn Brockinton to move here for a season and start a church that would equip relational reproducible disciples. They moved here on February 2nd, 2011. On March 6th of 2011, LifeNet Church began meeting in the Brockintons home with two other families and a couple of single young ladies. 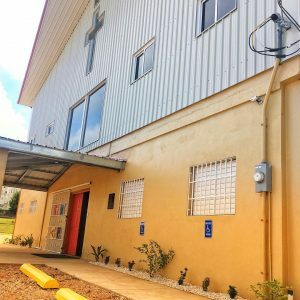 On April 3rd, we moved to the George Price Center in Belmopan and began meeting there on Sundays at 10:30am. We started our 1st Net Group on Thursday Night. Why do we call ourselves LifeNet? The word Life is acutally an acronym that defines our mission (see below). Net describes a network, working together as a team to reach out and love God and this community. LifeNet Church is a Foursquare Church. The Foursquare logo symbolizes and describes the complete gospel of Jesus through four essential principles. THE CROWN – symbolizes that Jesus is soon coming King.